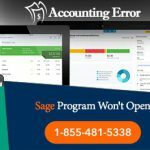 Sage is one of the finest accounting solutions in the world at the moment. The software is equipped with everything that an accounting expert would need. It makes a lot simpler for the accounting world to manage the financial flows. Plus, the ease of maintaining records makes it easy for the companies to check out their financial situation at any time. 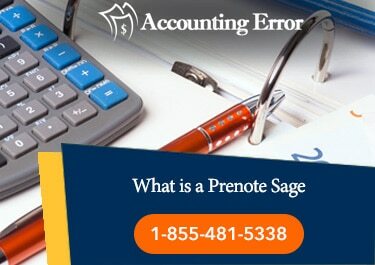 One of the other major features of Sage accounting solution is a Prenote. Now, you must be wondering, what is a Prenote? A Prenote is nothing but a test transaction which usually gets sent back to a bank to ensure that the given employee account data is accurate. This is done before setting up the direct deposit transfer in order to pay that particular worker. Prenotes is one of the most significant parts of Sage software. If you want to know more about Sage Prenotes, you may call our Sage tech helpdesk. Our Sage tech support team will help you with all the information which you may need related to the Prenotes. Why do we need Prenotes? Prenotes are one of those necessary transactions which we always need for each and every direct deposit employees in the Sage accounting solution’s Payroll Essentials. The core function of Prenotes is that it enables the employee to receive a manual or even a paper check at times for the first pay run which is done just after the company sets up a direct deposit. 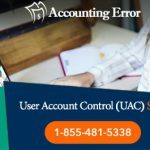 Prenotes make it easy for the companies and the accounting experts to do less errors. Now, you must be thinking when the employee’s direct deposit will turn into active status after the Prenote? When a fresh direct deposit account is inserted on a worker’s record, the account is needed to go via a prenote process with the financial institute, the bank in order to check the account data is apt or not. After the direct deposit account data is typed in on a worker’s record, the prenote file is automatically activated to send to the bank every time the user submits a payroll. In case the user wishes to initiate the prenote process right before submitting the next pay run, you have the option to manually generate it as well. After the prenote file is created, it takes approximately seven to ten working days for the direct deposit to become active. You may easily find the Prenote Date simply by navigating to a worker’s record, and then you can select the Direct Deposits options which is present on the left side. Afterwards, you may click the direct deposit account in order to see the Prenote Date. In case the Date is not filled, the prenote has not been generated yet. 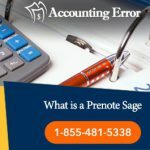 If you have some more queries related to Prenote in Sage, then please call our Sage technical helpdesk ✆+1-855-481-5338. Our Sage technical team will assist you with anything related to Sage. See Also What to Do in case of ‘Sage 50 an Unknown Error Has Occurred’?